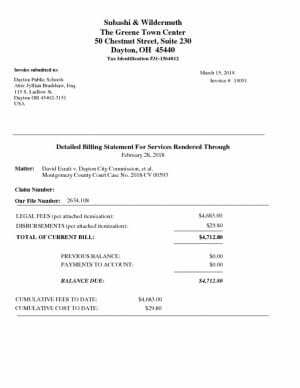 The School Board has spent $12,500 of their money defending themselves, to claim that they are entitled to have illegal secret meetings about closing schools in Dayton. The City, using their own attorneys has probably spent about a quarter of that. There is no question that the task force was a public body, according to the judge, the evidence, all captured on video by David Esrati, is clear, that the task force did meet in their mobile yellow meeting room at the four schools, and the board HQ. All you need to do is watch the video. I tried calling Brian to make this offer- however his cell phone just disconnects when I call. To date, the schools have spent $12,500 with Mr. Wildermuth to try to defend those without a defense. I can’t guess what the city has invested. Before we go to the expensive part, I’m offering to settle if the parties admit guilt, and that they clearly violated the sunshine laws in the school task force case, on numerous occasions. First on Jan 9, with the meeting that ended up being cancelled. Second on Jan 24, when both Mims and Al Hamdani claimed they didn’t have to do this in public. And multiple times on the day of the tour- where I count Valerie, Meadowdale Elementary and Meadowdale High School, Wogamen and the HQ building- each as a separate meeting. Basically- each stop of the bus. Take those 7 violations- x $500 and then the question becomes is the organization liable or the individual violators? If we do it per elected member of the task force- it comes to $10K. Still, cheaper than the $12,500 the schools have already paid Mr. Wildermuth for this case. The caveat is, with their acceptance of guilt, the 4 elected officials (Harris, Al-Hamdani, Walker, Mims) would be referred to the Ohio Auditors Open Government Unit for evaluation on removal from office. Seeing that I’ve yet to find a single instance of a public official being removed from office in the State of Ohio for violations of the Sunshine laws, they should have nothing to worry about. The Sunshine laws are here to protect us all, they shouldn’t be used by lawyers to put their kids through college. There is absolute evidence that discussions did take place on the bus, questions were asked, and video and audio recording equipment were banned, as well as non-compliance with notification of this event, and evidence that School Employees willfully suggested that communications not be conducted via email to hide these proceedings from public scrutiny. You will not win this case in court, or in the court of public opinion. I am open to a counter-offer on the settlement amounts, however, let us be clear, that the average citizen wouldn’t have the capacity to fight this case, making it unlikely that I’m going to have invested this much time and energy and money, to allow you to be the only winner (Mr. Wildermuth). The people of Dayton deserve better. And I don’t take on battles that I will lose. Your offer seems quite reasonable. I’m sure they got a great laugh out of that….